Over the past two months, I’ve built out three new niches sites and revamped two old ones. I’ve had a blast building them and watching them grow. I’m sure most of you have heard of niche sites by now. They are a great way to earn income on the internet. Frankly, some people earn a ton from their niche sites. I can’t say I’ve found that perfect niche just yet, but I’m working on it. But for me, just the journey of trying to find that perfect niche is incredibly fun. Finding that “just right” niche that receives lots of traffic and earns lots of income is much like trying to find buried treasure. I love solving problems, and finding that “niche site buried treasure” is ultimate problem just begging to be solved. Product based sites provide reviews and information around products available for purchase. These sites are comprised mostly of product reviews that contain affiliate links. Additionally, the sites provide information related to those products as well. For example, a laptop niche site would provide reviews on various laptop models and also provide informational articles like how to pick the best laptop, types of laptops, etc. With product based niche sites, you spend the majority of your time researching products in your niche and writing reviews on these products. The reviews can either be done using by purchasing and reviewing the product yourself, or using information available on the web. Information based niche sites focus on answering people’s questions and providing them with “how to” articles and tips. These are my personal favorite sites to build. Information niche sites provide lots of information on the niche, and use ads and affiliate offers to generate income. An informational site example could be a site on how to repair cars, or even more micro niche “how to change brakes”. This site would provide articles that explain about brakes, how to change brakes, provide tips on changing brakes and even have video content. Income generation would occur through related ads and affiliate links for tools, brake pads, parts, etc. I love finding hidden gems. I enjoy the process of doing niche site keyword research and finding low competition and high search volume “niches” that would be interesting to write about. I love learning. When you build niche sites, you get to spend a great deal of time learning about new things in order to write articles. I love learning new things and expanding my areas of knowledge. I love watching them grow. I get a great deal of personal satisfaction and self worth out of creating something and watching it grow. Just checking my Google Analytics each week and seeing my niche sites trending upward is a huge moral boost for me. The growth drives me. I love to diversify my income. Google loves to change things, and people’s interest jump around all the time. Unfortunately this can impact your revenue. Having multiple sites on various different topics can really even out your monthly income. I love helping others. One of my core values is making a positive difference in people’s lives. I love helping people, and creating niche sites is a win/win for me. I have fun building them, earn a little money, and help people out – all at the same time. I love writing. Writing is certainly not my forte, but writing is a growth and learning process for me. While I’m still not a great writer, I’m certainly far better than I was when I first started blogging in 2007. Unfortunately due to people who aren’t honest and are just looking to earn a quick buck, niche sites have a bit of a bad reputation. Some see them as just conduits to earning money and as not credible as a result. These same sites like to use “black hat” SEO tactics, and as a result recent Google algorithm changes have hit a number of these “less than credible” sites hard. These are not the types of sites I like to build. I like to build honest, genuine and beneficial niche sites. Sites that really help people. I do a tremendous amount of research before I begin writing to make sure the information and reviews I provide are accurate. This is all part of the final reason I like building niche sites: I’m want to set a new standard for them and change the general perception people have about them. In line with Google’s direction, I want to create and build niche sites that provide real value to the reader. I sincerely want to help them. Have you considered starting a niche site? I’d highly recommend you give it a try. Not sure where to start? Join the “Niche Site Community” on Google+ and we’ll help get you started. Great stuff as usual Larry!! Love the stuff about treasure and hidden gems. That is what you find when you do the right research, and the rewards are awesome. What a great article. I am currently working on a niche site and it is a ton of work. Lots of fun, but also many details. I enjoy interacting with the community of the niche I care about – it is great to meet passionate people that care about the same things I do. The potential to make money is an awesome thought as well. I haven’t made any money yet, but I am looking forward to the day that I do. Hey Matt and thanks for the comment. Keep at it, an the money will come. To make money, you need traffic and traffic takes time to build up. Thanks Larry for another enjoyable read. That is interresting. I never saw you promoting your niche sites on Google+. Even in this article you don’t provide link to them. Why ? Are you relying only on SEO in order to acquire new visitors? Hey Alexandre – I have, but I try to promote them during off hours and the weekends. I didn’t link to them from this article as I don’t like to interlink my sites as I’m concerned Google might perceive that as intentional link building. Just not worth the risk. I am relying primarily on search engines, as those are the visitors that generally convert anyway. 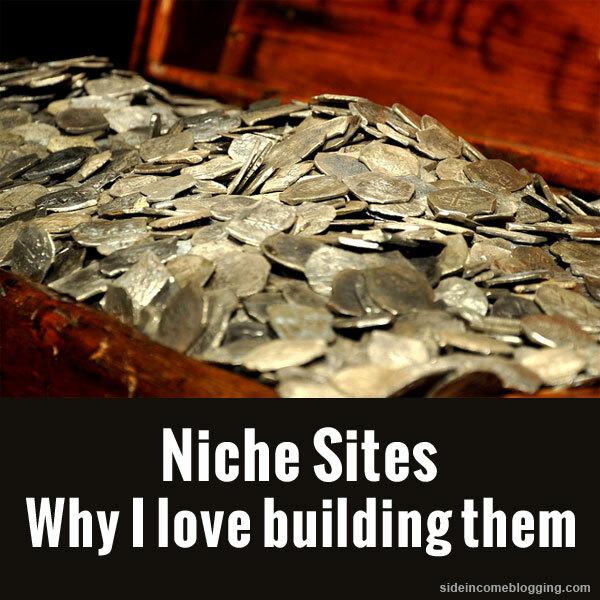 What link building are you doing for your niche sites? I often focus mainly on blog comments, as they are niche relevant links, and I’ve automated much of the process. Matt, I don’t link build. I let links build naturally to my sites.